Even the mighty Apple misses the mark on occasion. John Paczkowski (@JohnPaczkowski) of the tech blog All Things Digital cited sources close to the situation as suggesting that Ping will be gone with the next major release of iTunes in the Fall. The plug is being pulled on the “test” after less than two years for Apple’s social “music” network when it debuted on September 1st, 2010. Instead Apple has stated that it will focus on partnerships with Twitter and Facebook to better integrate into their dominant social webs. Originally, just hours after the service launched it was heralded as a success with Apple sending out a press release stating that they had registered over one million Ping users in the first 48 hours. But not everything seemed right and soon the questions came flooding in about fake accounts being created, including singer-songwriter Ben Folds who claimed that an account had been created in his name but he had no idea who had created it. At the time Apple had also confessed to a major blunder with their Facebook integration. The integration between Ping and Facebook had originally worked but Apple had failed to secure an agreement before they launched Ping. Job’s cited the fact that Facebook wanted onerous terms that Apple could not agree with and so in response Facebook denied Apple’s ability to use the Facebook API with Ping. The *really* sad deal with Ping is the amazing service Apple destroyed in its march toward failure: Lala. Lala was a fantastic music service with a unique structure — you got 1 free listen to anything from their robust catalog, from a single song to a full album, and then could buy a selection for a reasonable cost and have it stored in the cloud. Even better, you could correlate the music files you already owned with Lala’s database, so you wouldn’t have to re-purchase music — a harrowing idea for any company like Apple. It was also incredibly successful as a social platform for sharing and finding music. I developed a really interesting network of music lovers who I had never actually met in person, and I learned about some great new music. I also knew several people who started spending money on music again — a real shocker in my crowd. 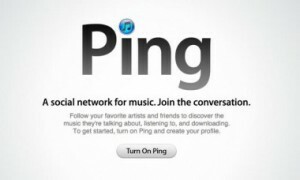 Just as it seemed to be gaining critical mass (or at least strong momentum), Apple bought Lala and turned it into Ping. A successful service gobbled up by a giant, which then failed to capitalize on a promising development. Alas, Lala.